The imminent prospect of a week spent in the mountainous terrain of Amsterdam meant that I leapt at the chance of a quick day out today, despite a fairly dire forecast. As the worst weather was in the north, a quick drive south to the Black Mountains fitted the bill, and I was parked below Hay Bluff before mid-day. 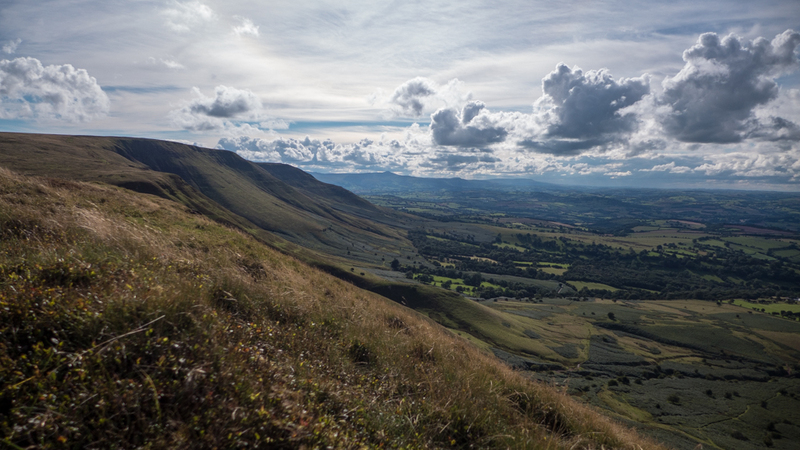 The climb up Hay Bluff isn’t long but it’s a rude wake-up to legs that haven’t got into the swing of things, and I was able to grab a couple of minutes at the Trig point to relax and enjoy the views over the escarpment. 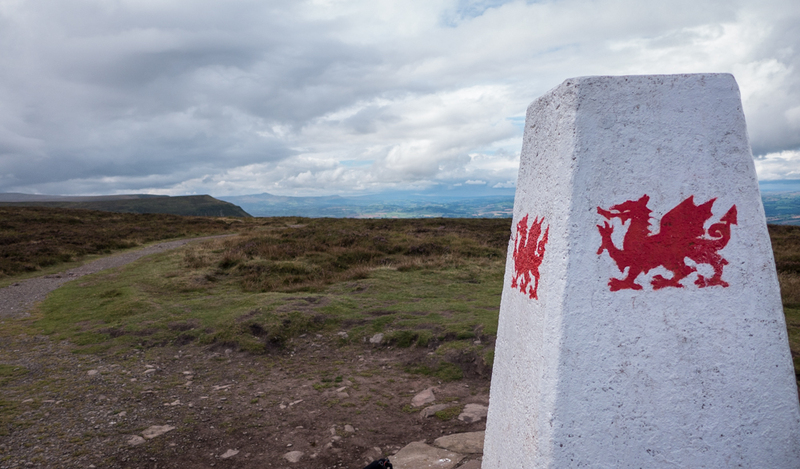 The trig point is painted white, and decorated with red Welsh dragons, The English border is just a couple of hundred metres away, and the next section south follows the Offa’s Dyke path. The path south over Black Mountain is well paved with stone for much of the way, and the dry weather had made the unpaved sections fast and easy too. A few spits of drizzle. and ominous clouds in the west, but everything stayed dry. 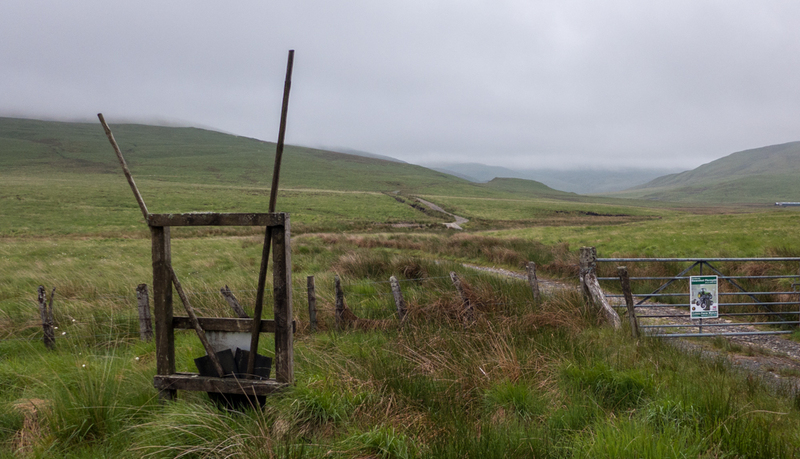 After a minor navigational faff where I’d made the classic mistake of trying to walk down a county boundary, I was losing all my hard-gained height and heading down to Capel y FFin. There’s a good path all the way that weaves down through the bracken, and luckily the start is marked with a small cairn on the Dyke path. 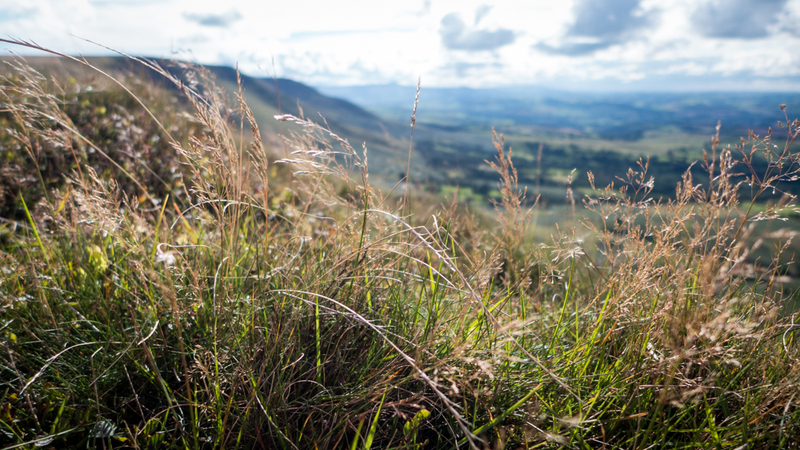 After the wide -but dull – views from the ridge, dropping down into the lush valley was a joy. After crossing the stream I walked down the road towards the chapel, admiring the antics of drivers on the single track road. When a 4WD that wouldn’t reverse met an oncoming driver that couldn’t, I was able to walk round them both while they attempted to resolve matters. My plan from here was to head onto the ridge that would take me – eventually- back to the car, via Twmpa (AKA Lord Hereford’s thingamabob). The escarpment is almost vertical in places, but a good rocky path zigzags though the steepest sections, with good views back over the valley to the Black Mountain ridge. On reaching the ridge, I turned south towards Chwarel y Fan – another of those indistinct tops that are really just local high points on a ridge. I arrived at the cairn, and any prospect of a leisurely lunch was ruined as the black clouds finally started delivering the rain they’d been promising all day. Waterproofs on, and a grabbed sandwich and I was heading back to the North. For about 10 minutes the rain was torrential, and freezing cold. 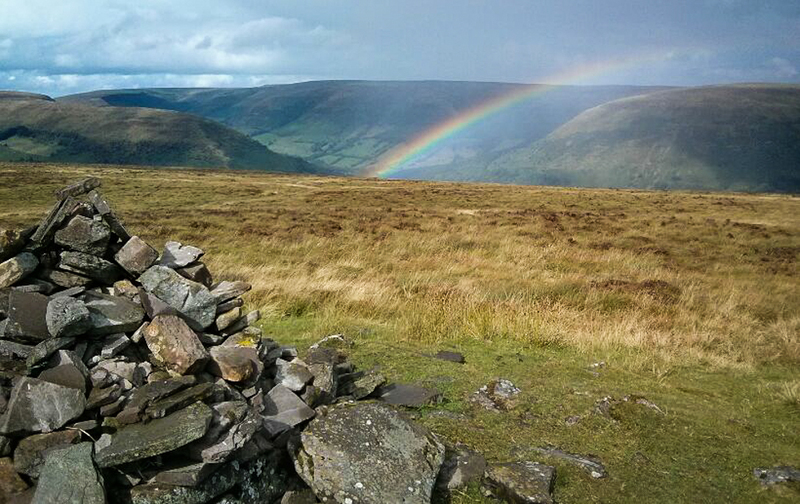 It then cleared almost as suddenly as it had started, leaving a briefly gorgeous rainbow over the Vale of Ewyas. The long slog north to Twmpa is finally rewarded with great views over the escarpment to the north, with the hills of the Elan Valley and Radnor Forest clearly visible. From here it was an easy descent to the head of Gospel Pass, followed by a mile on the road back to the car. 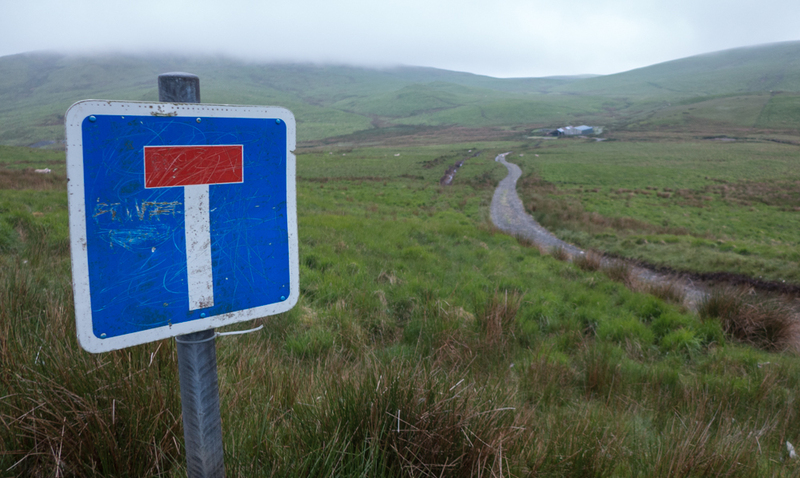 By 5:30 I was parked at above Maesnant, at the far end of the Nant-y-Moch reservoir. Cloud was obscuring even the minor tops, but down here it was clear dry, and just a little breezy. Today’s route meant that wet feet were going to be almost unavoidable, so I opted for trail shoes instead of boots, on the basis that they’d probably dry out faster anyway. The path on from Maesnant heads downhill at first, and a footbridge gives you the option of crossing the Afon Hengwm. On the spur of the moment, I crossed over and headed up the Hyddgen valley, with Glyndŵr’s ‘Covenant Stones’ visible on the far side of the river. I followed the track all the way to the edge of the forestry, where two old and probably rotten fire-beaters stand proudly. The ground here is so wet you could probably drown just trying to reach them. I returned the same way, making the most of the good track before re-crossing the river and following the faint and boggy path to the ruined house where Cwm Gwerin meets the Hengwm. 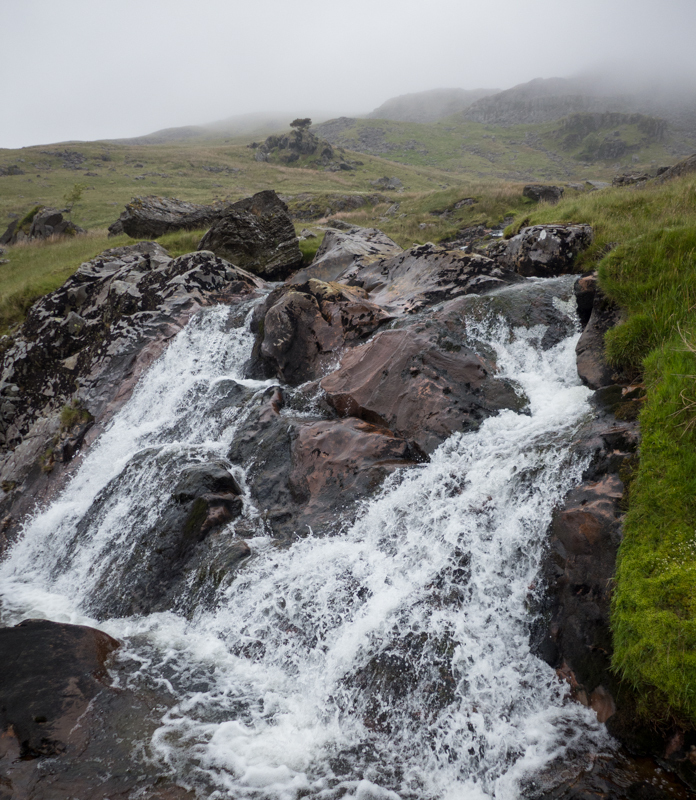 I stopped just long enough to wring water our of my socks, as I could see the cloud had lowered up the valley and the wind was carrying a fine spray of drizzle. 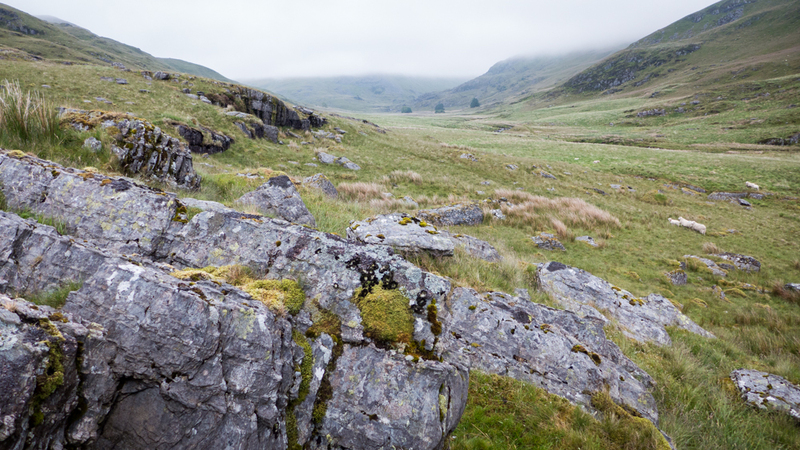 Cwm Gwerin is a delight – the rocky crags towering over on the western side grab the attention as you slowly gain height, past waterfalls and with Wheatears for company. 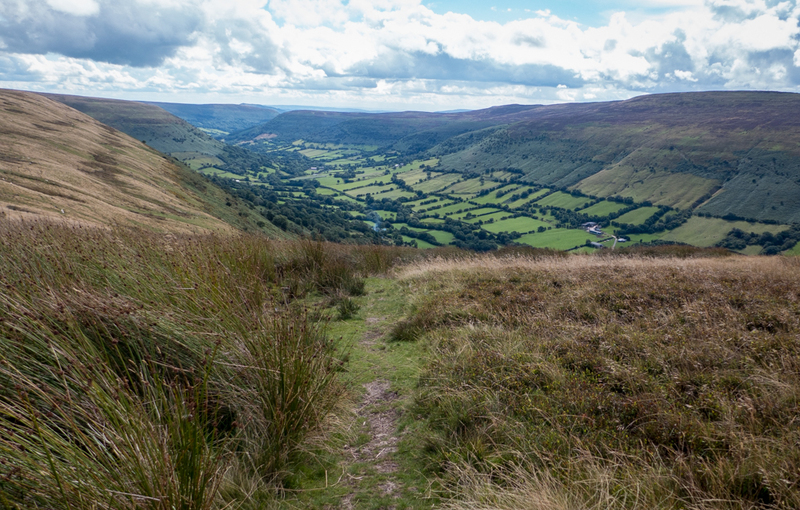 The cwm widens out at the top, and finding a dry path is a challenge. My photographs don’t do it justice, so I need to come back when the light (and weather) is better. 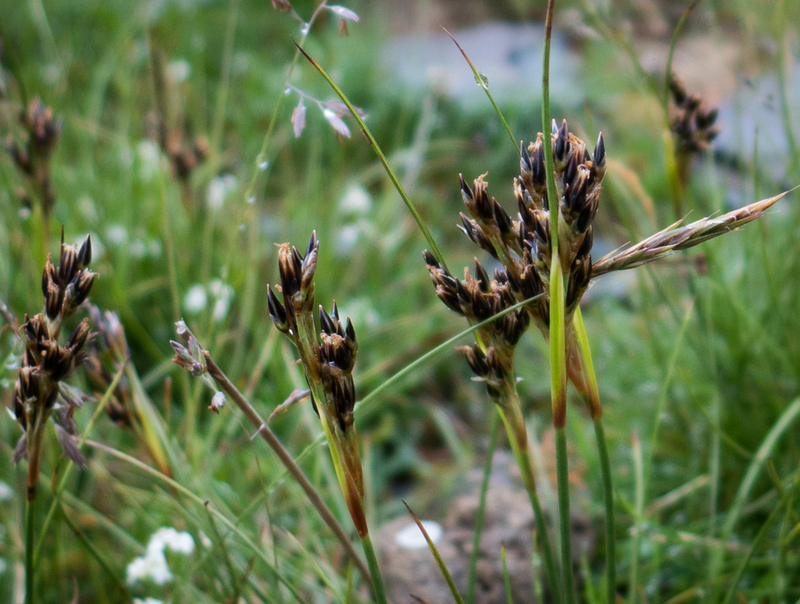 As I climbed upwards towards the plateau, I realized how much the cwm had been sheltering me from a very strong westerly wind. I was in the cloud now, with the steady drizzle reducing visibility even further, making navigation difficult. I stopped just below the crest and took advantage of a lull to have some breakfast and repeat the dance of wringing out the socks. 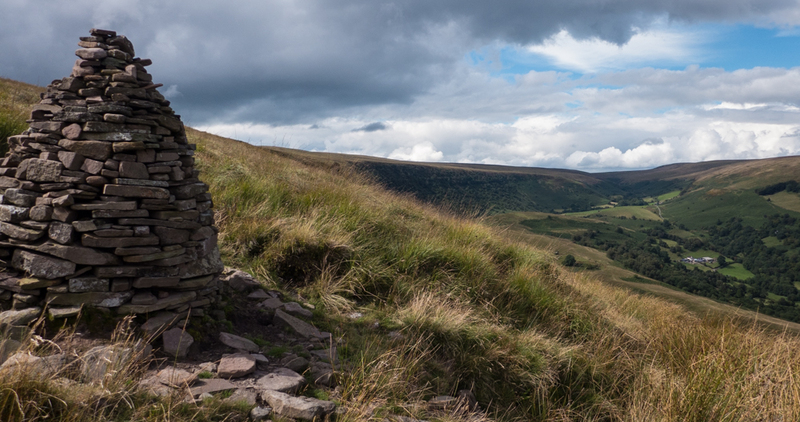 I struck out across the plateau, heading for the windshelter on Pumlumon Fawr. Given the conditions, I was glad to be on familiar ground. 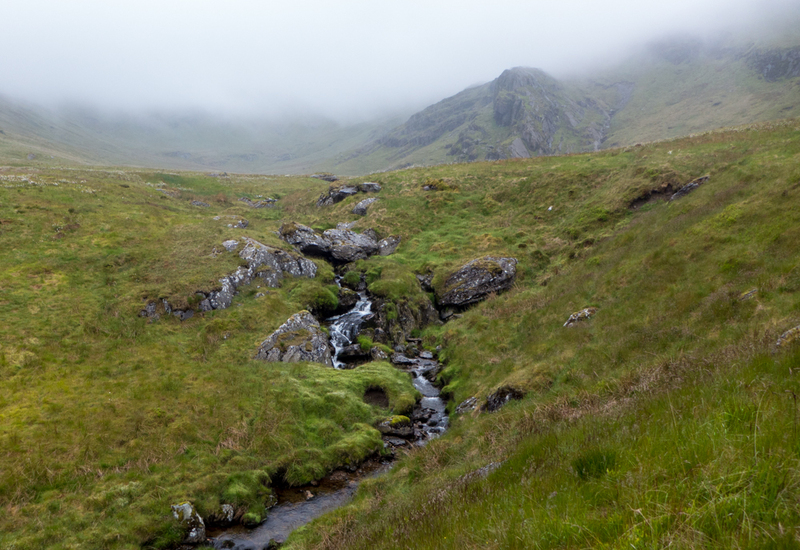 I was able to find the faint path down towards Pumlumon Fach without trouble, and soon below the worst of the weather. The reservoir track from Llyn Lygad Rheidol was sheltered at first, but after it turns to the left I was back heading straight into the wind, so I took a downhill shortcut to the car after passing the three small lakes. While the rain had never been that heavy, It was enough to completely wet out my Marmot softshell in a few places, so changing into dry clothes for the drive home was very welcome. It looked like for once I’d picked the right weather window. Plans for a day walk on Saturday were quickly rescheduled to include an overnight camp, with the extra flexibility in terms of time being counterbalanced by having to carry a heavier pack.